Disclaimer: This material is being kept online for historical purposes. Though accurate at the time of publication, it is no longer being updated. The page may contain broken links or outdated information, and parts may not function in current web browsers. Visit chandra.si.edu for current information. The number 16 can be pretty special. For many people, their 16th birthday is cause for celebration: perhaps an opportunity to drive a car, a time to think about the next steps of education, or simply accumulating more knowledge and information about the world around them. This summer, NASA's Chandra X-ray Observatory celebrates its own "sweet 16." 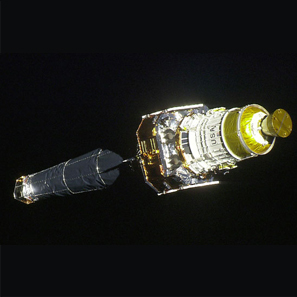 July 23rd marks Chandra's birthday, as it was launched aboard the Space Shuttle Columbia and then deployed into space on this day sixteen years ago. In August, Chandra will pass the 16th anniversary of another milestone in the mission - the release of the "First Light" images from the telescope (see Cassiopeia A below). To mark these coming-of-age moments for Chandra, we've assembled some facts about where Chandra and the scientists who use this Great Observatory find themselves on this auspicious birthday. For example, do you know how far Chandra has traveled since its launch? Or how many scientific papers its data have produced? What about how many objects this extraordinary X-ray telescope has looked at? Thanks to all of the amazing discoveries Chandra has made over its first 16 years in orbit and operations, this birthday does seem exceptionally sweet. Chandra has had its driver's license for a while now. 2,200 orbits of the Earth.  Pluto and the Earth is about 4.6 billion miles. Chandra's orbit goes about 1/3 of the way to the Moon. 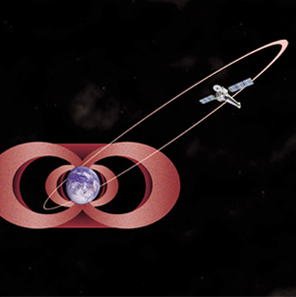 This schematic side view of Chandra's orbit, shows the inner and outer radiation belts. This image of NASA's Chandra X-ray Observatory following deployment from the Space Shuttle Columbia was shot by Columbia Astronaut Mission Specialist Cady Coleman, during the STS-93 mission. 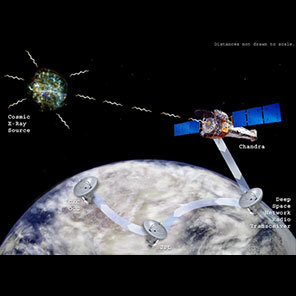 Chandra uses the Deep Space Network, a series of radio dishes around the world, to call home. Chandra has been marking educational milestones. 14,000 observations over the last 16 years. rate of about a paper a day, a good reward for all of that hard work. 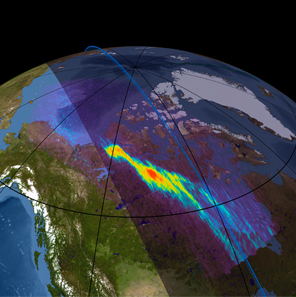 On February 15, 2004, Chandra observed X-rays produced by an aurora in the north-polar region of Earth. Chandra's image of M82 shows a galaxy undergoing a burst of star formation. 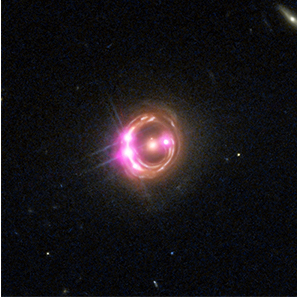 Chandra & Hubble data show quasar RX J1131-1231 which hosts a supermassive black hole spinning extremely rapidly. Chandra has been busy hanging out with friends. One thing that is often true about teenagers: they enjoy being with their friends and socializing. 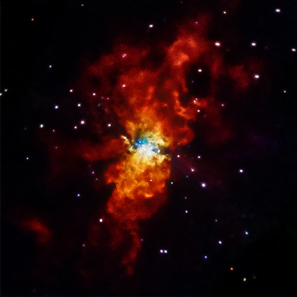 The Chandra X-ray Observatory is no exception. While Chandra doesn't physically hang out with its telescopic buddies - some of which are orbiting in different parts of space and others that are found on the ground around the world - they do get together virtually. This means that Chandra's data are often combined with those from other telescopes to both make scientific discoveries and generate some spectacular images. Chandra is celebrating! Here are some party favors.